Do you know Dobble, the craziest observation and speed game on the market? Discover the Corsica version! 55 cards each with 8 symbols, 1 single and unique identical symbol between each card... Players must find it faster than their opponents! 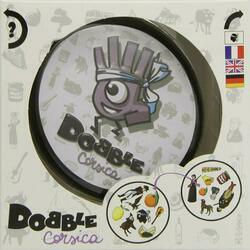 Dobble Corsica offers typical symbols linked to Corsica (donkey, local charcuterie, Colomba, vendetta figure imagined by Mérimée...) and an original "vendetta" variant with a 100% Corsican accent! Contents of the box : 55 cards, 1 explanatory booklet concerning the symbols of the cards, the rules in 3 languages.